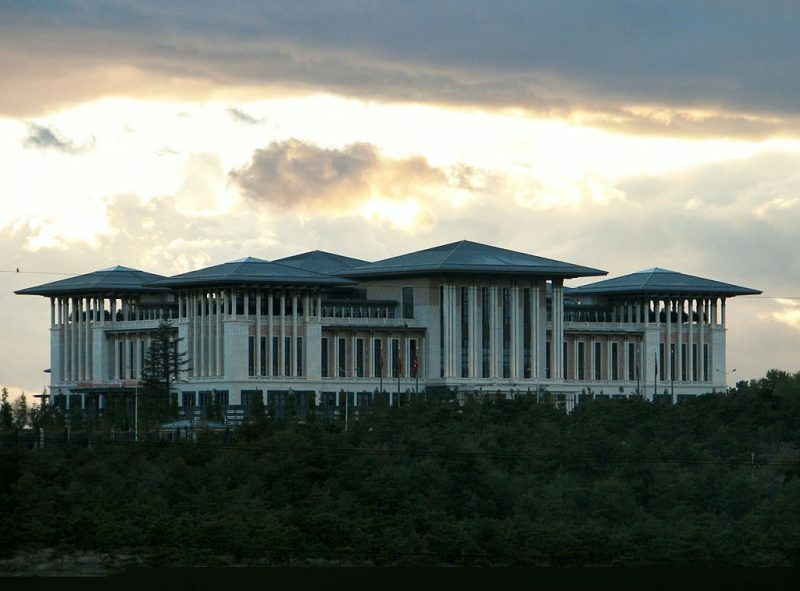 The Ak Saray Presidential Palace in Ankara. Creative Commons. By author Ex13 . “This country is split down the middle like a watermelon,” political commentator Hasan Celik kept repeating again and again in a live broadcast on Kanal D* as the results of the country's controversial April 16 constitutional referendum trickled in. Initially they showed a convincing victory for ‘Yes’ in a vote on granting vast new powers to the previously ceremonial office currently occupied by President Recep Tayyip Erdogan. By the end of a long night that margin had narrowed significantly, and complaints of violations in the vote were rife. According to the preliminary count, ‘Yes’ won with just 51.3% of the vote. The changes passed on Sunday will allow the new president the right to dismiss the parliament and appoint ministers and other high-ranking officials without vetting processes. They will allow him to appoint half of all senior judges, call referendums, declare emergency situations and issue decrees with the force of law. They mark the end of Turkey's parliamentary republic . Erdogan's campaign was launched in the middle of an emergency situation following a failed coup attempt last summer that saw opposition politicians and unsympathetic media outlets fall under criminal investigation. It won the day by winning the country, but it lost out to ‘No’ in key cities including Ankara, Istanbul and Izmir, highlighting swelling opposition to his AKP (Justice and Development Party). Majorities and playing tough to get them have been the theme of the past two years for Erdogan and AKP. In June 2015, the party that has dominated Turkey's post-millennial politics suddenly lost control of the parliament as the pro-Kurdish, left-leaning People's Democracy Party (HDP) entered the legislature for the first time in a dramatic vote. The parliament's four parties, however, could not agree a ruling coalition. This paved the way for a fresh vote in November, for which AKP ran a campaign rooted mostly in fear amid attacks on the free press and government military operations in the country's Kurdish-populated southeast. The party regained its majority. After Sunday's referendum, even AKP party members expressed surprise at how tight the results were. And yet, in their victory speeches, neither current Prime Minister Binali Yildirim — whose post will be retired as a result of constitutional changes — nor President Recept Tayyip Erdogan, gave much credence to the other 48 percent plus of voters who voted against the amendments. Nor was there mention from either man of the reported violations that undermined the vote. This video was circulating widely on social media platforms and was even featured on one of the Turkish television channels following election results live. There was also the controversy of Turkey's Higher Election Board changing an important regulation by allowing electoral officials to count unstamped ballots despite that decision violating the electoral code. As a result of these and other violations, opposition parties contested the outcome of the vote, something that is virtually without precedent in Turkey's modern history. At around 11 pm local time, citizen journalism platforms began sharing videos of what appeared to be organized neighborhood action protests in Istanbul's Kadikoy, Moda, Besiktas and Cihangir neighbourhoods. There was also a familiar noise coming from many more neighbourhoods; the banging of pots and pans, which became a popular protest action during the 2013 Gezi protests that set the stage for a new, concerted opposition to Erdogan's rule. Citizens who have found Referendum results questionable have started gathering in Besiktas as well. President Erdogan was unshaken, signalling that among his first decisions as an emboldened president would be the introduction of capital punishment in a balcony speech that seemed to push Ankara even further away from its stated goal of accession to the European Union. The vote's outcome has caused consternation and celebration in almost equal measure. But there was a sweeping consensus about one thing: just how much Turkey has changed in the space of a few years. * An earlier version of this article named the channel Hasan Celik made the comments on as CNN Turk. Although Celik is a presenter on CNN Turk he made the comments on Kanal D where he appeared as a guest analyst.